Surgeon General of the U.S. Air Force. 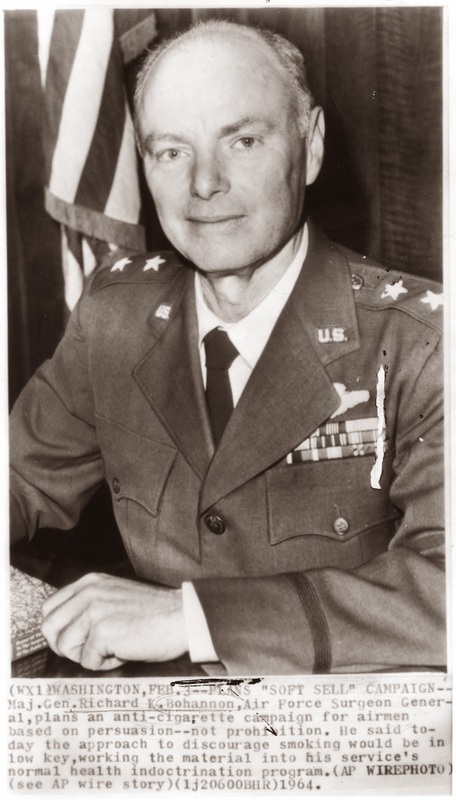 In 1964 the new Surgeon General of the U.S. Air Force, Lt. Gen. Richard Bohannon, arranged for two Air Force flight surgeons (ref. 1) per year to train as jet pilots in hopes that some of them would become astronauts aboard the planned military Manned Orbiting Laboratory (MOL). His further expectations are not available for analysis; a Freedom of Information request to the Air Force did not produce any relevant information. When the MOL program ended without any flights just five years later, 17 test pilots had been selected as military astronauts, but no physicians. Enthusiasm for the pilot physician program waned among Air Force leadership soon thereafter (ref. 2). Dr. Bohannon’s efforts were consistent with the standards of the mid-1960s. When the “other” American space program, NASA, selected non-pilot specialists such as physicists, astronomers, geologists and physicians to increase the scientific productivity of planned space station and lunar exploration missions, their astronaut managers insisted that any who were not already qualified jet pilots be sent through Air Force pilot training before reporting for space duty (ref. 3). These managers were mostly either test pilots or aerospace engineers accustomed to working with test pilots, and they believed pilot training provided a minimum common background and necessary skills to all who would be astronauts. Despite their impressive overall credentials, not all astronauts come to NASA with operational skills and experience. Since the mid-1960s, NASA astronauts have primarily used the T-38N jet (the “N” identifies NASA’s modified version of the Air Force T-38 trainer) to combine “rapid response training” with the skills, cognitive control and urgency of life and death decisions that is considered critical in the professional astronaut corps. Among all of the simulators and training systems used by astronauts, this was (and is) the only one providing an environment including acceleration and G-loads, confined stressful physical environments, and exposure to a realistic psychological stress environment in which participants cannot always walk away from their mistakes. Jet aircraft training has instilled and expanded candidates’ capability and competence in performing in a fast-paced spaceflight environment (ref. 4). Four physicians selected by NASA as astronauts in 1965 and 1967 dutifully entered flight training, although one left NASA in short order for personal reasons. On graduation they joined a fifth physician-astronaut who was already a qualified jet pilot before coming to NASA (ref. 3). Together they embodied Dr. Bohannon’s vision of pilot-physicians eligible for space missions—but just not in the program he originally intended. By 1978, when NASA next recruited physicians as professional astronauts, it no longer required pilot training for all astronauts. The Space Shuttle era promised flights of such mild conditions that non-pilots could successfully participate. In fact, the front seat in NASA’s two-seat T-38 jets was eventually limited to just highly-qualified test pilots, possibly for insurance purposes, so even the physicians NASA had earlier insisted become jet pilots were no longer eligible to be “first pilot.” However, even today, career astronauts who are not military pilots still maintain proficiency as back-seat crewmembers, doing everything except the actual piloting. Twenty-eight physicians have been chosen as professional NASA astronauts from 1965 to 2013, including one who has only just been selected and is not yet eligible for spaceflight and another who left NASA before becoming eligible for spaceflight assignment (ref. 5). Of the remaining 26, 7 have been jet qualified, including 4 who were pilots before their selection by NASA. One physician astronaut was never assigned to a flight and is not currently on the active roster. Another one has been assigned and is now training for his first flight. Two others flew in space and received additional flight assignments but were unable to complete them. Interestingly, all four of the physicians who arrived at NASA as qualified jet pilots were from the Navy or its sister service the Marine Corps, not the Air Force. Three of them were products of the Navy’s physician-pilot “dual-designator” program (ref. 6), similar to the Air Force pilot-physician program; the fourth was a Vietnam-era Marine Corps aviator who attended medical school after leaving the service. In fact, two of them had even been through test pilot school (ref. 7), which qualified them to continue piloting NASA’s training jets even when their colleagues lost that privilege. The Air Force had apparently considered sending their pilot-physicians to test pilot school, probably to increase their attractiveness as military astronauts, but it was rejected as an unnecessary complexity and delay (ref. 8). Individual pilot-physicians may have applied on their own initiative, as did these two Navy pilot-physicians, but apparently none were successful. When he arranged for two pilot training slots per year for Air Force flight surgeons, Dr. Bohannon essentially posed a hypothesis: assuming that pilot-trained physicians will be important in developing means to protect military astronauts from the deleterious effects of long-duration spaceflight, are they likely to be more acceptable to spaceflight managers who select pilots to be astronauts, and thus more likely to fly on space missions? As I described previously, renowned test pilot General Chuck Yeager oversaw the selection of the military astronauts, who were all graduates of the test pilot school under his command. Quantitative analysis in this case is not straight-forward. The independent variable is whether or not the astronaut was a military-trained pilot. Admittedly, many non-pilot astronauts earn ratings as private or commercial pilots, and those who had been military flight surgeons acquired considerable experience in the back seat of jets (ref. 9). Thus the distinction between pilot and non-pilot physicians is not always distinct. But for the purposes of this discussion, I am considering only those who graduated from military flight training, either before or during their NASA careers. This was the criterion invoked by Dr. Bohannon, since his candidates were already Air Force flight surgeons and still he pushed for them to become trained as pilots. Two dependent variables can be evaluated. The most obvious is actual spaceflight. Perhaps a more informative variable is flight assignment. The state of being a physician-astronaut is not an intrinsic characteristic that independently results in a spaceflight. Such assignments are made by the astronaut’s superiors. Even if an assignment does not result in a flight, it reflects the value of the pilot qualification in improving the attractiveness of a physician-astronaut for that flight. To date, 26 of the 28 professional NASA physician-astronauts have been eligible for assignment to spaceflight during their active careers. Those meeting the pilot criterion received an average of 2.4 (range 1 to 6) assignments and made an average of 2.1 (range 1 to 6) flights, slightly exceeding the average of 1.7 (range 0 to 5) flights and assignments for their non-pilot counterparts. Rigorous statistical analysis is not appropriate in this case; it is sufficient for our purposes that all ratios round to the same whole integer: two spaceflight assignments per physician astronaut, regardless of pilot-training. NASA’s experience vis-à-vis the contribution of piloting qualifications to the success of physician astronauts is informative. It is not obvious that qualification as a first pilot in jet aircraft has led to more success in spaceflight, as judged by flight assignments. However, from personal observation, all physician-astronauts performed as well in spaceflight as Dr. Bohannon had expected of his candidates in the 1960s. This speaks of the character of people who succeed as astronauts: many of them are able to undertake more than one complex career path and succeed, including such diverse skills as medicine and the engineering-intense test pilot training. Earlier, I noted that NASA was the “other” American space program in regards to physician-astronauts. In fact, NASA has flown additional physicians on the Space Shuttle, from Canada, Europe, Japan and Russia as well as America. Except for the Americans, they were almost always professional astronauts in their national astronaut corps. Many were private and commercial pilots or had considerable experience as non-pilot crewmembers aboard aircraft (ref. 9). However, none of them met the Bohannon criterion of pilot-physicians. Finally, there are still “other” space programs actively flying astronauts, namely the Russian and Chinese. So far, there have not been any Chinese physician astronauts flown or even selected for training. The Russian and former Soviet space program has launched seven physician-cosmonauts a total of 11 times (two flew twice and another one flew three times) (ref. 3, 10, 11, 12). Two of them met the Bohannon criterion, and one became a military test pilot after his medical training. A similar analysis can be performed as for NASA, except the dependent variable must be only actual flight and not assignment, given the vagaries of flight assignments during the Soviet era. In this case, there appears to be a disadvantage to being a non-pilot physician cosmonaut, because they have not been part of the same dominant cosmonaut cadre formed in 2011 as the pilots and engineers. Therefore, they were unlikely to have had the same eligibility and access to flight assignments. One of the non-pilots is currently making his first flight so the number of spaceflights by non-pilot physician cosmonauts would increase if he flies again, but their ratio will not soon approach that of the pilot-physician cosmonauts. The test pilot-physician left medicine completely before becoming a cosmonaut and devoted himself to aviation, so he was a pilot-physician in name only, and is now retired. Thus, in the two populations of astronauts for which data are available, the trend is for pilot-physicians to be selected at a higher rate than non-pilot physicians. The distinction is slightly stronger in the Soviet-Russian case, but no statistical analysis seems appropriate given the small and uneven sample populations. Professional astronauts throughout the histories of NASA and other space agencies have necessarily been generalists in the fields of spaceflight engineering and science. Physicians have skills that are beneficial during research and clinical care episodes, but those are not the majority of in-flight activities on space missions to date. Additional qualification as jet pilots seems not to have had a major bearing on the success of physicians as astronauts, probably due to the general preparation and specific training they have all received for their missions, and the highly integrated nature of space missions to date. In conclusion, the hypothesis I have attributed to Dr. Bohannon has been tested in two separate space programs over the four decades since he conceived it. The answer so far seems to be: maybe. In the U.S. space program, there is no meaningful difference in the flight-assignment rate, and thus programmatic acceptability, of pilot-physicians over non-pilot physicians. In the Soviet-then-Russian program, there does appear to be a slight numeric advantage to being a pilot-physician, but the numbers are so small and confounded as to be unreliable. My assessment is that the null hypothesis cannot be rejected: there is no meaningful difference in the crew-assignment frequency of one group over the other. This indicates that both groups are viewed as equally important in constituting space crews. Dr. Bohannon identified a need for clinical and biomedical expertise in early astronaut crew composition, which was already biased in the direction of operations and away from utilization. He acted to remedy that weakness within the constraints of his time and situation. His foresight and initiative helped make possible the diversity of disciplines now considered necessary for successful space missions and the capacity of modern astronauts to embody those disciplines. For a brief but helpful overview of this military medical specialty, see “Flight surgeon” at http://en.wikipedia.org/wiki/Flight_surgeon (retrieved Nov. 3, 2013). Mapes, P.B. “The history of the United States Air Force Pilot-Physician Program,” Aviation Space and Environmental Medicine 62:75-80, 1991; http://www.ncbi.nlm.nih.gov/pubmed/1996937 (confirmed Nov. 2, 2013). Shayler, David J., and Colin Burgess, NASA’s Scientist-Astronauts, Springer-Praxis Publishing, Chichester, UK, 2007. National Research Council, Committee on Human Spaceflight Crew Operations, Preparing for the High Frontier: The Role and Training of NASA Astronauts in the Post- Space Shuttle Era, The National Academies Press, Washington, D.C., 2011, pp. 70-78, http://www.nap.edu/download.php?record_id=13227 (retrieved Nov. 1, 2013). “Astronaut Biographies,” http://www.jsc.nasa.gov/Bios/ (retrieved Nov. 2, 2013). Kelly, G.F. “The history of the United States Navy flight surgeon/naval aviator program,” Aviation Space and Environmental Medicine 69:311-6, 1998. One of them, Manley L. Carter, Jr., is documented in United States Navy Test Pilot School, Historical narrative and class information, Supplement for years 1984 to 1992, Fishergate Publishing Co., Annapolis, MD, 1992. Koritz, T.F., “USAF Pilot/Physician Program: History, Current Program, and Proposals for the Future,” USAFSAM-TP-89-9, July 1989, specifically comments of Dr. Burt Rowen, p. 24, http://www.dtic.mil/tr/fulltext/u2/a212671.pdf (retrieved Jan. 7, 2013). National Research Council, 2011, pp. 70-78. Vlassov, Vasiliy, and Igor Ushakov, “Soviet Pilot-Physician Program,” Aviation, Space and Environmental Medicine 70:713-6, 1999. Hooper, Gordon R., The Soviet Cosmonaut Team, Volume 2: Cosmonaut Biographies, 2nd ed., GRH Publications, Gunton, England, 1990. McHale, Suzy, “RuSpace, Cosmonaut Group,” http://suzymchale.com/ruspace/cosgroup.html (retrieved Nov. 2, 2013).